I bucked my natural instinct to do a more elaborate invitation and went with a simple card that asked guests to "come in from the cold and have some fun, Agatha is turning one...". 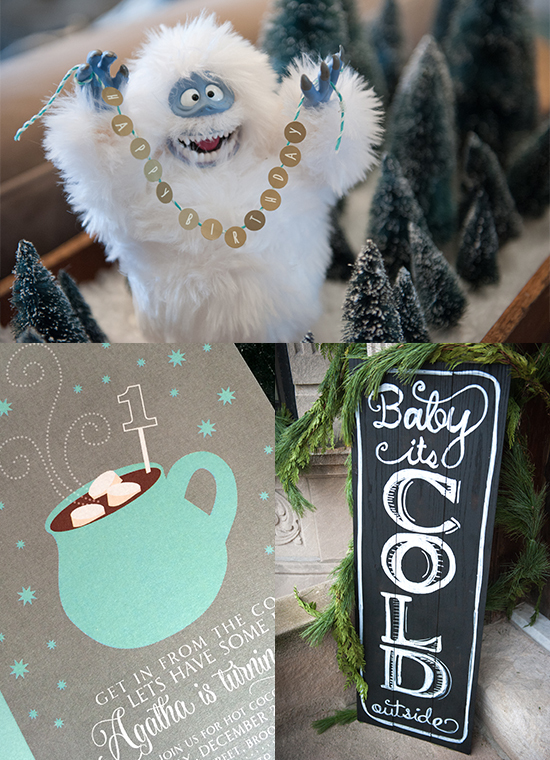 I also repurposed the abominable snowman Christmas centerpiece into a birthday party decoration and left the "Baby It's Cold Outside" sign I made earlier this month to welcome guests at the front door. It was a little hard to see here (next time I need to use black window marker, not white!) but I put up a few fun Agatha facts on our dining room mirror. Winter Birthday Party Favors were "Make Your Own Snowmen Kits" found at a discount shop that I added some fill and hot cocoa packets to before adding a tag that read: Thanks a million for coming, here is something to take. Just add some fresh snow and a snowman you'll make. We hired a local puppeteer to perform for the kids and set up our own makeshift puppet theater using some tiny Ikea chairs and a sign made of cut out cardstock strung on fishing line. Lastly, I decorated the house with as many photos as I could fit on my walls. Since a good number of the guests were adults, we knew we had to feed them well. 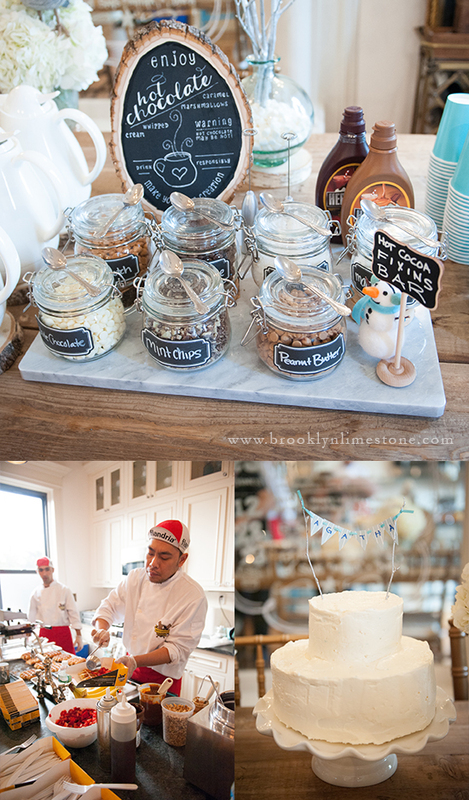 At our winter birthday party, we offered a hot cocoa bar with all the fixings served alongside homemade marshmallows. I made the hot chocolate sign on the wood slice using some chalk paint and white gel pen. A marshmallow tree finished off the tablescape. In terms of winter birthday party food, the highlight was certainly the delicious Belgium waffles made by food truck masters, wafels and dinges (if you are in NY, do not miss your chance at trying these!). To finish off, my sister in law made a simply delicious and beautiful cake. I don't think anyone left hungry! The kids all seemed to enjoy the puppet show, all of the guests seemed to enjoy the food and we were so happy to have so many people join us to celebrate Agatha's first birthday at our Winter Birthday Party. Looking for other Birthday Party Ideas? 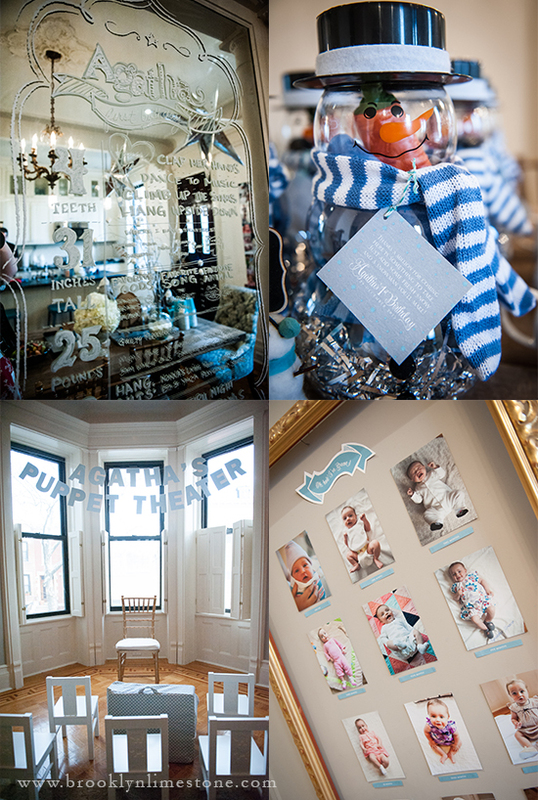 Check out Agatha's Paris Birthday Party or her Birthday Slumber Party. Happy birthday beautiful agatha! What a fun and creative party, I love the marshmallow tree and waffles, yum!! Agatha is absolutely adorable! Love the party concept. Wow beautiful ! We both have Winter babies. We just had a Winter Onederland themed party ourselves. Some similar ideas. Awesome stuff !!! What an adorable party! And food truck waffles and a puppeteer? Genius! Agatha is lucky to have parents who throw her such fabulous parties. Happy birthday little one! Whaaaaat? You can hire wafles and dinges to cook in your home??? Love the idea of hiring a puppeteer too!! Love every little detail of this party. I hope you had some coolicles! (Those pickles soaked in koolaid I think?) Happy Birthday Agatha! Simply perfect...as always! Happy Birthday Agatha! It looks like a great party and little Agatha is an adorable 1 year old. Happy birthday precious little one. Looks amazing!! Great job as usual!! What a blessed family you all are! Happy New Year!! Oh that is my favorite food truck. Oh New York how I miss you so. What an awesome idea for a party!~ Happy Birthday!! I feel like I always say the same thing over and over again, but this was amazing! Super cute, but not over-the-top ridiculous. Elegant and adorable at the same time! Agatha is adorable. Congratulations and Happy Belated Birthday to her. I think the first birthday is more of a celebration for the parents though. You made it one year, woohoo! As usual your display looks magazine worthy. And that is one cute Bumble! This looks so cozy and lovely!! 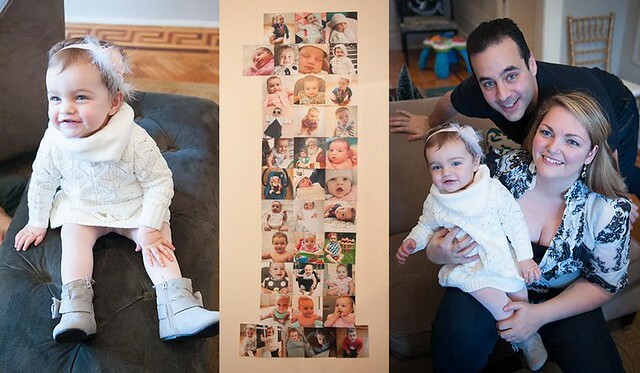 What a wonderful first birthday for your little gal. She looks so sweet. Happy Birthday, Agatha! What a wonderful theme and party! And a gorgeous family!  I love your gorgeous hot cocoa bar and love the idea of having a puppet show. Such fun! ANYhoo, it looked amazing and delicious and really fun! Well done, Mama! Everything looked absolutely spectacular!! Happy (belated) Birthday to Agatha! That's a charming idea for a birthday party - definitely no overdone and very very cute! And, of course, everything looks perfect. Happy birthday, Agatha! Happy birthday Agatha! The party looks amazing! Great job! My son loves hot chocolate and this is his first year at college so when he came home fr Christmas we had a permanent hot cocoa bar set up. Edible sprinkles - even gold stars from the cake decor dept. A new hot water pot was in order, new mugs, red napkins with white polka dots. Sprinkles of many kinds. Each time I made him a cocoa I made it different with different sprinkles and colors and gave each one a name. Did it for the whole family so everyone wanted to know what their cocoa was named - things like Winter Wonderland etc. Ghiradelli had vegan cocoa - just call them to find out which or look for the ones you have to mix with "milk " and then use non-dairy. This is such a « cool » theme! I would have never thought about that! And that invitation: GORGEOUS! She is so beautiful! Happy 1st year to Agatha and her parents! Thanks for sharing! Happy Birthday to your little love. A memorable 1st b-day. Love your theme which is ageless and timeless. Everything you do is clever and melts my heart. That snowman is just too cute. So creative! Thank you for sharing.